The fastest residential pecan cracker on the market is now available in the customer-requested top-loader design-- Kinetic Kracker Model 3. Just as fast as the Model 2 but with a top-load design that provides more than twice as much time for pecan placement. Upgrade to the Kinetic Kracker Model 3 for ease of use, increased safety and faster cracking! Classic Model 2 Kinetic Krackers available only while supplies last. Building on the long-time popularity of these crackers, the Kinetic Kracker III adds a top loader apparatus that acts as both the shield and pecan inputter. Users simply put the pecan in place on the top-loader feeder and the pecan drops into the cracking cradle for that perfect crack. Users have more than double the time to place the pecan in position-- allowing for ease of use. No more placing the shield in a specific position. The top-loader feeder remains in a fixed position. Check out the video of KKIII to see just how easy and fast it is to crack pecans at a rate of over 1500 per hour! The Kinetic Kracker is simple and easy enough to use that most members of the family could help out with the cracking and shelling with a little supervision. 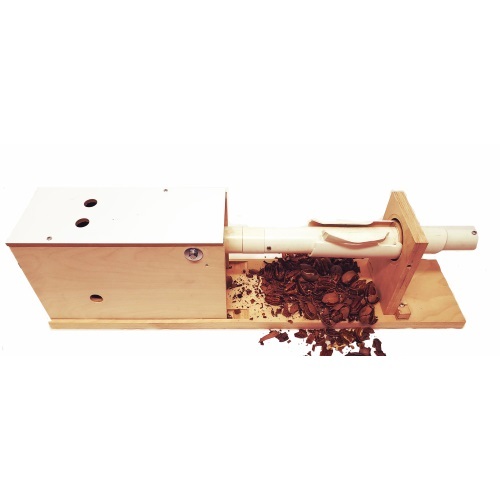 Just check out the video of our Kinetic Kracker electric nut cracker to see that young man easily cracking all those pecans! How could it get any better than that? Our electric nutcracker is handmade right here in America by Americans! A wood box encloses the motor to ensure safety and a wooden base gives sturdiness. The unique design of our Electric Pecan Cracker allows it to apply the precise amount of pressure needed for your pecans without crushing them. Nearly every time, your pecan will easily slide from the shell with a gentle tug to free the nut meat. Simple and easy. The Kinetic Kracker electric pecan cracker has been flying off of our shelves! We manufacture our electric crackers to the highest standards. Word of mouth is really getting around as people who love using their Kinetic Kracker to shell all those nuts tell their loved ones and even buying them as gifts so others can enjoy their very own freshly shelled pecans from the trees in their own yards. We took our faithful Kinetic Kracker electric nut cracker design, looked it over, and gave it some upgrades. Back and better than ever with more nut cracking power, our Kinetic Kracker delivers the ability to crack 1,560 pecans per hour with 26 RPM motor versus the previous 1,200 nuts with 20 RPM motor that the original design offered. I know that sounds like it could get hot quickly, but each one comes with a fan cooled motor, so don't fret! Do your hands get tired from manually cracking and shelling pecans or does lack of strength due to arthritis prevent you from cracking and enjoying the nut meat from your prized pecan tree? Are your pecan trees full of nuts that you just want to store away? Sometimes, especially during the Holidays, the demand for all those candies that require shelled pecans makes it hard to keep up, but not any longer! QUICKER CRACKING AND SHELLING POWER THAN EVER! But hurry as supplies may go fast! Wonderful! It's a bit noisy, but is much less tedious than cracking each pecan by hand. Makes a big mess with shells flying all over the room, but small price to pay for the increase in speed. Am going to have to use it on the porch for the rest of the crop. Sometimes the nuts are over or under cracked, but for the most part does a great job. Get one, you will be very happy with it.